Did you know that 80% of all cell phone subscribers carry their mobiles around with them all day? Cell phones have undoubtedly become a huge necessity in our lives; it's as if our brains have an internal check list reminding us to grab our cell phones, our wallets and our keys. Needless to say, when listening to the radio, watching TV, reading the newspaper or skimming through a magazine, today's consumers have their cell phones on hand and are definitely prepared to utilize them. 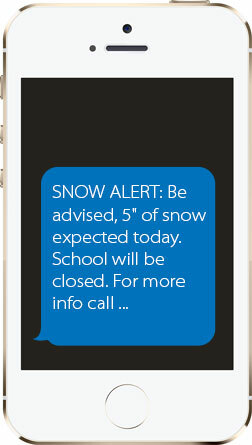 Text to students with campus alerts. Send text with educational info, school calendar events, and special student events. Stay connected with the parents of your students.